The cloud storage management portal mechanism allows cloud consumers and cloud service consumers access to interact with and control data stored in a cloud environment. 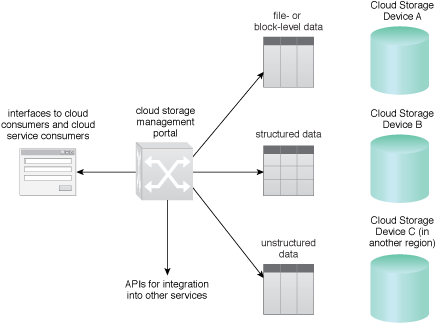 This mechanism can be implemented to store data in the cloud in different formats, including structured and unstructured datasets, and to store data in different types of cloud storage devices. It also allows cloud consumers to access data regardless of its type and underlying cloud storage device type. The cloud storage management portal mechanism provides a feature for data owners to publish and share data with other cloud consumers inside or outside of the cloud environment. Data owners are given control to govern who can access their data using an API. An integration point is provided via an API for required applications to interact with datasets stored on a cloud storage device. Cloud consumers can publish datasets or grant access to other external users via the use of integration APIs and by further integration of the mechanism to other cloud service consumers and identity sources. Different types of cloud storage devices can be used to store different types of datasets that cloud consumers can access and interact with from a single point via a cloud storage management portal mechanism, as shown in Figure 1. Figure 1 – A cloud storage management portal mechanism acts as a single point of access between the cloud consumer and different types of datasets stored on cloud storage devices.